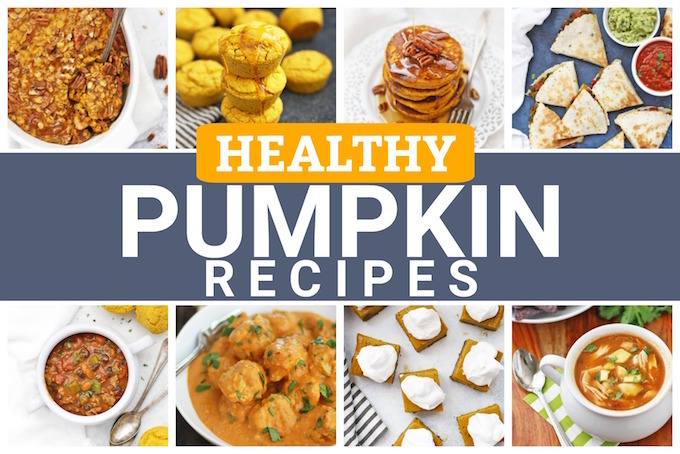 The BEST Healthy Pumpkin Recipes to Make This Season – From vegan, to paleo, to gluten free, and more, these are some of my FAVORITE healthy pumpkin recipes to make! Have you enjoyed pumpkin week as much as I have? I love getting to work on projects like this. My house has smelled amazing for the last few weeks, and we’ve been taste-testing and recipe testing like crazy. 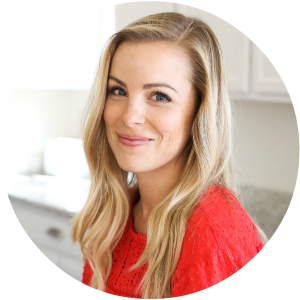 I’ve loved seeing a mix of savory and sweet recipes, new options and old favorites. It’s also fun when you get to team up with a friend. Melissa and I have been online friends for several years now (we’ve talked on the phone, texted, messaged, etc, but never met in person–yet!). She’s had lots of yummy choices. Baked Pumpkin Oatmeal – Gluten free, vegan, and TOTALLY amazing, this baked oatmeal feels almost like dessert for breakfast (without being loaded with sugar!). 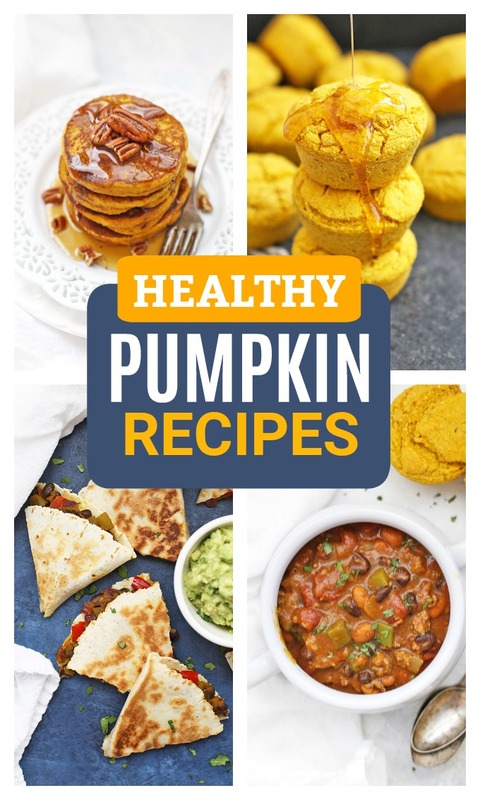 Blender Pumpkin Pancakes – The next best thing to having a personal chef is having an appliance that makes dinner for you. Let your blender do the work with these easy blender pancakes. Top them with syrup, toasted pecans, or a dollop of homemade Nutella! Pumpkin Chocolate Chip Muffins – Our all-time favorite pumpkin muffins! These are Milo’s favorite food on the entire planet. We make a batch 1-2 times per month all year long. Dairy free, gluten free (or not), and naturally sweetened to boot! Maple Pumpkin Pecan Granola – I love making a batch of granola to make the whole house smell amazing. This Maple Pumpkin Pecan granola totally delivers. Enjoy it plain for a snack, with milk for breakfast, mixed into trail mix, or sprinkled over smoothie bowls or yogurt! Gluten Free (or Not!) Pumpkin Cornbread Muffins – Serve these tender, fluffy muffins with soups, chilis, or salads. They’re so good, we make them year round! Pumpkin Chili – This tasty chili is as flexible as it gets. Make it vegan, paleo, or simply as written. You can even cook it in your slow cooker! 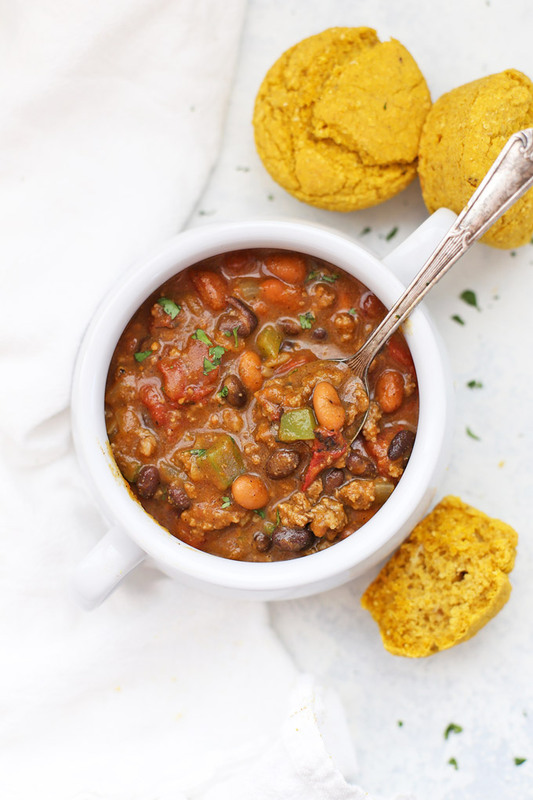 Slow Cooker Pumpkin Taco Soup – One of my all-time favorite recipes. We make this soup all year round. I love that the slow cooker does the work for you. This is a great one to keep in your back pocket, since you can even enjoy it on Whole30. Thai Curry Chicken Meatballs – A red curry recipe without tomatoes! The meatballs are amazing, but the real star is the velvety curry sauce made with PUMPKIN! You’ll be scooping up the sauce with a spoon and dreaming about it at night. SO good! 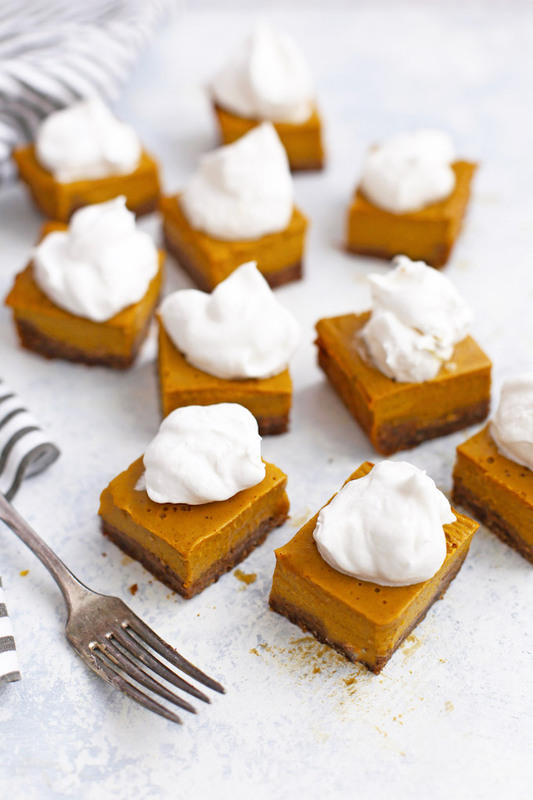 Pumpkin Pie Bars with Ginger Cookie Crust – These gluten free (or not) pumpkin pie bars are naturally sweetened, dairy free, and about to change your life. Pumpkin Energy Bites – Melissa makes these look GOOD. Honey Roasted Pumpkin Seeds with Cinnamon – Take your pumpkin seeds up a notch with Melissa’s spice blend. How to Cook Pumpkin in a Slow Cooker – Perfect for making your own puree! Pumpkin Spotlight – Fun facts, tips and tricks for all things pumpkin! PS – Don’t miss more Pumpkin favorites over on Melissa’s blog! 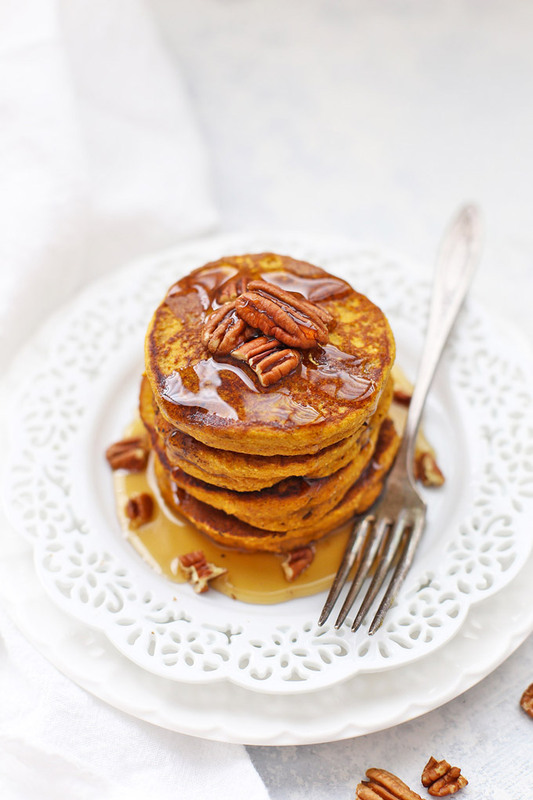 I made your blender pumpkin oatmeal pancakes this morning: so delicious. Thank you for your recipes. I am going to try your baked pumpkin oatmeal, chili, and meat balls as well. I cooked up my Halloween jack-o-lantern and pureed the pulp so now have 28 cups of pumpkin to use. My husband is allergic to tomatoes, so I find your meatball recipe intriguing. I can’t wait to try the rest of your recipes. Linda – I’m so glad to hear you enjoyed the pancakes! They’re one of my very favorites! Hope you enjoy the other recipes just as much!